Welcome to Chris Robinson’s Plymouth website. If you have fond memories of Plymouth, Devon, or even if you live in the city itself, then you will love this site. 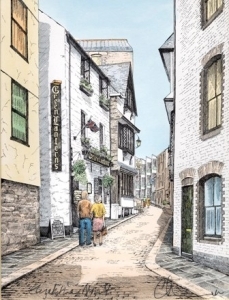 Over the last twenty years Chris has produced over three hundred drawings of the Plymouth and surrounding area. Chris Robinson’s Plymouth Prints is not just about the three hundred plus prints that Chris has produced over the last thirty years. He has also published numerous books, videos and DVDs on Plymouth since 1980. We are now able to offer online secure ordering of the goods on this site. However, if you prefer you may purchase items from this web site by telephone. Please call Plymouth Prints on (01752) 228120 or write to us at: 34 New Street, The Barbican, Plymouth PL1 2NA.